TamilNet: 12.12.05 "STF, SL Ministers complicit in paramilitary operations, Karuna in India"
"STF, SL Ministers complicit in paramilitary operations, Karuna in India"
The two paramilitary cadres who surrendered to the Tigers in Amparai disclosed that Karuna operates from India and that Pillayan was leading the Karuna group operating in the east. They also revealed that Sri Lankan Government Ministers A L M Athaullah, Douglas Devananda and Maithripala Sirisena are complicit in helping paramilitaries operating in the east, during a press conference held at Thenakam guest house in LTTE controlled Karadiyanaru Monday. The cadres also said that the paramilitaries were involved in violence against Muslims to create dissension between Tamil and Muslim communities. The cadres said that the group was led by Pillayan. Iniyabarathy was functioning as the head of their team in Amparai. They were told by Pillayan, Mangalan master, Iniyabarathy and other operatives that Karuna was operating from India. "The group of fourty men is headed by Pillayan, and Karuna is in constant communication with Pillayan and other key persons. Karuna talked to me recently before we reneged from the group," Gnanatheepan, who claimed he was second in command next to Iniyabarathy, told the media. The cadres said Sri Lankan Army Intelligence commanders, Capt. Sureshkumara and Capt. Abeyaratne were the ones who dealt with Pillayan and Iniyabarathy directly. "Transport arrangements, arms and ammunition supplies are arranged by the Sri Lanka Army Intelligence," Gnanatheepan said. However, the funding was being provided by an external source through a key operative Uruthira, he said. They were receiving 30 000 rupees as salary, the cadres said adding that the lower ranks were paid at least 10 000 per month. Karuna Group cadres were mainly based in two places, Thivuchenai and Thirukonamadu, according to Puhalventhan and Gnanatheepan. Gnanatheepan further said 22 paramilitary cadres, including Puhalventhan and himself, were recently moved to a safehouse in Manthoddam, an SLA controlled area in Amparai, for instigating violence between Tamil and Muslim communities. Sinhala villagers had protested to their presence in the village. A buddhist monk and a Sri Lankan Military official convinced the villagers and arranged another safe house in the area, he added. Athaulla's close associate, Fowzer, was in regular communication with Iniyabarathy, the cadres claimed. Fowzer was also helping the group to secure a safe house at Pachchilaipalli in Akkaraipattu and to establish direct links between Athaulla and Iniyabarathy, cadres further said. "Creating dissension between the Muslims and the Tigers was key to succesful survival of the Karuna Group," Iniyabarathy had repeatedly told his cadres, Gnanatheepan said. Iniyabarathy communicated with Douglas Devananda every morning, he said adding that Devananda had gifted a computer to Iniyabarathy. The surrendered cadres also said that journalist Nadesan was shot and killed by Iniyabarathy. A direct meeting took place between Sri Lanka Minister Maitripala Sirisena and Mangalan master at Thivuchenai in Welikanda, prior to the recent presidential elections, Gnanatheepan said. Sirisena, according to Gnanatheepan, sought help from the paramilitary to campaign for Mahinda Rajapakse in Polannaruwa and the SLA controlled areas in Batticaloa. Both the cadres were close friends and following a period when they were disturbed by their own conduct, they resolved to deal with their situation and waited for a suitable opportunity to escape from the SLA controlled area, they said. "We wanted to leave, and resolved to do it in a meaningful way," Puhalventhan added. "The opportunity arose when we were taken on a mission in the no man zone area," he added confirming that they shot and killed Iniyabarathy and three other operatives last Monday. The cadres who carefully avoided mentioning specific operations they were directly involved, told the media that they were brought to Palpody Military base in Batticaloa in Buffel APC vehicles 3 days prior to an ambush on Tigers in Vauvunathivu on October 11 and were taken close to the border area by the Sri Lanka military. The cadres said their real names are Thurasingham Chandrakumar, 21, alias Puhalventhan (from Kaluwankerni), and Samithamby Arunkumar, 26, alias Gnanatheepan (from Vantharumoolai). Chandrakumar's two sisters were shot and killed in revenge last Wednesday by paramilitary cadres. The Tigers on Saturday conferred "Tamil National Patriot" titles to the two sisters, Mrs. Yogarasa Yogeswary, 26, and Thurairasa Vathany, 17, who were buried Saturday. Athaulla is Minister of Fisheries and Housing Development, Douglas Devananda is Minister of Social Services and Social Welfare and the leader of the paramilitary and political party EPDP, and Maithripala Sirisena is Minister of Agriculture, Environment, Irrigation and Mahaweli Development in the cabinet of Sri Lankan President Mahinda Rajapakse. 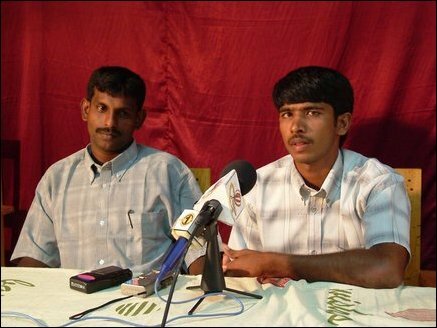 LTTE's Political Head in Batticaloa Mr. Ilanthirayan (Marshall) and Amparai District Political Head Mr Daya Mohan were present at the press conference that began at 11:00 a.m and concluded at 12:30 p.m.